Understand the length of the statement, which you are going to write. Usually, it is not long as selection committee has no time to read stories. It should be concise and precise. A single page will be enough. If you have no idea about writing the statement, read a few sample statements, just to see the approach. But make sure, don’t copy from others. Read about the program you are applying too. Visit their website and get information. You will be able to right the specific things, they are looking for. Mention your achievements and skills, which are close to their expectations. Make a few strong points and mention them clearly. Try to write in an interesting way, but don’t lose your track. Before ending clearly show your intentions, that you want to join their residency program. Revise what you have written and don’t provide any wrong information. An attractive introduction will grab the attention of the reader. Instead of telling in simple words, show your abilities by mentioning your life experiences. However, it should not be long and boring. Prove yourself an ideal candidate by mentioning your extracurricular activities, job experiences and hobbies. Mention why you are interested in family medicine. If you have any flaws in your application, you can clear them in your personal statement. Make it tidy and close on a strong statement. The personal statement is the important component of your residency application or we can call it the most important component of the application. There is no exact weight of personal statement, but it plays a vital role in your selection. So, what they are looking for actually. Personal statement is the reflection of your personality. The selection committee wants to know that wither you are suitable for that post or not and how you can present yourself in few lines. How much you know yourself and the field of family medicine. How you will be beneficial for their institution and how much capacity you have to learn from them? So, while you are writing a PS, keep these points in mind and you will be able to write a good one. 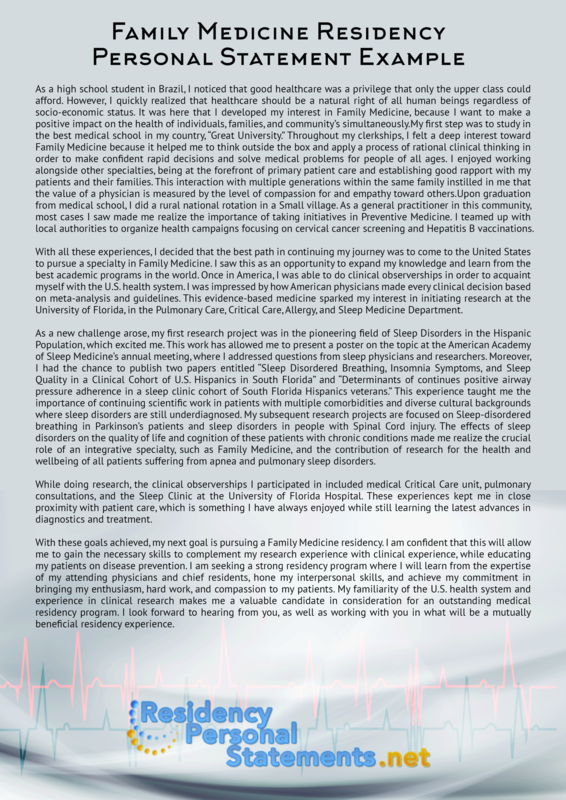 Here is some advice on writing personal statement for pediatric residency programs that would be right for you! University of Washington, Seattle, WA. UW Family Medicine Residency is committed to training family physicians through innovative educational and clinical preparation to provide future care services. The university’s training prepares future doctors for urban and rural medical condition and delivers excellent healthcare services. Here, you will develop your future as a leader, an academic partner and family physician. Oregon Health and Science University, Portland, OR. The OHSU’s Family Medicine Residency Program is in its fourth year. The program is designed for future physicians who are seeking for a comprehensive, competitive, integrated, and diverse residency program. The program provides a superior education in preparation for future challenges in the field of Family Medicine. University of Colorado, Aurora, CO. The university takes pride in its skilled, dedicated, and professional resident physicians who bring academic excellence to the program and for years. Here, all residents serve as role models for healthcare students and professionals. University of California— San Francisco, San Francisco, CA. The program is committed to training future medical leaders and physicians in the field of family medicine. This prestigious university and residence program has produced the well-known physicians and medical practitioners in the country. University of Michigan— Ann Arbor, Ann Arbor, MI. The university offers the best combination of medical training and academic excellence. Among its specialties, include family medicine and obstetrics in rural and urban communities. It conducts community outreach programs and offers international medicine opportunities. It is one of the best hospital universities with numerous well-established fellowships and curriculum. University of North Carolina – Chapel Hill, NC. The UNC Family Medicine residency program provides a full scope of medical and academic training. The university wants to prepare its graduates to the challenge of healthcare and ways to provide the medical needs of the community. It takes pride of its skilled and professional clinicians along with it excellent faculty. University of Missouri – Columbia, MO. The university family medicine programs aims to train skilled, competent and compassionate physicians prepared for the real-world challenges. Here, pieces of training are equipped with values and ethical practice, community immersion, and life balance to achieve a holistic learning. University of Wisconsin— Madison, WI. Family Medicine Residency Program at UW is providing personal and professional growth for its resident physicians. This growth is anchored on the dynamic academic curriculum with the support of the community, faculty members, and university program staff. Duke University – Durham, NC. Duke University is committed to train and produce excellent and skilled healthcare professionals with deep compassion to the community. Together with local healthcare partners and community-based organizations, the university strengthens its residency program. This is also an avenue for the institution to help communities in reducing health care gaps and promote wellness. University of Minnesota – Minneapolis, MN. It family medicine residency program prepares physicians for the real-life healthcare situations in urban and rural communities. It has a unique program curriculum with more focus on community immersion. First, you need a theme. If you’re sticking with your experience theme, make sure that it is related to family medicine. You can work with the experience that brings you closer to this field and makes you more passionate about it. In talking about your experience, you have to highlight how committed to you are to your specialty. It is also recommended to talk about your future plan in your personal stamen. This makes the evaluator see how you plan your medical career ahead and how driven you are as a student. 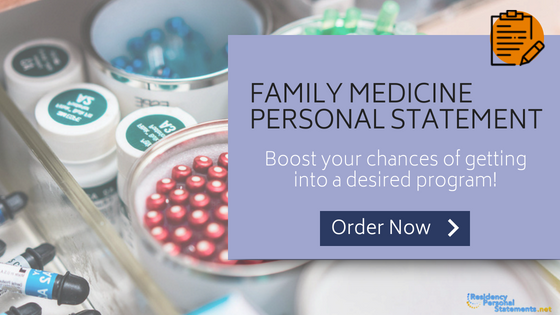 If you find it difficult to write your own, you can always turn to the best online agency that provides professional help for writing family medicine personal statements. Then you can relax and just wait for the final product delivered to you. Don’t write long and boring statements, rather make it attractive and interesting. Mention your particular interest in family medicine through your life or job experiences. Clearly state why you are interested in their institution. How to start: make an interesting start by mentioning your interest in family medicine. What to write: write about your experiences, passion for family medicine, achievements in this filed and why you want to join their institution. How to finish PS: Finish personal statement on a strong note, ensuring them you are the right candidate for this post. What are your attributes? What do you have to offer the program? What career path do you wish to pursue after graduation? Have you had any patient care experiences that have solidified your desire to pursue family medicine? 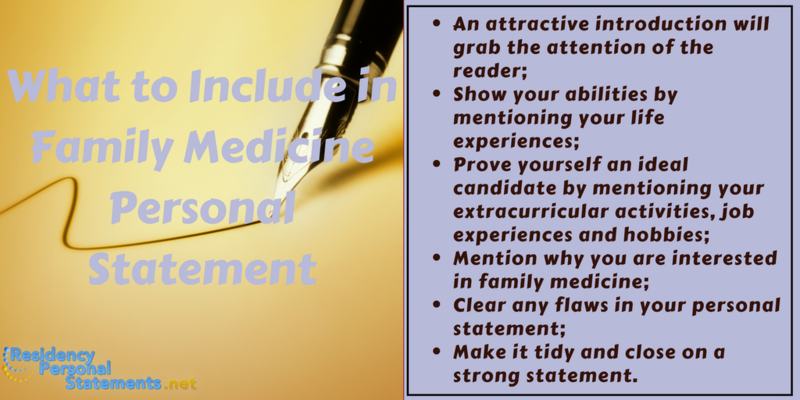 Be sure that our professional writers will create a paper even better than our family medicine personal statement sample!